The Dogon work hard as farmers to keep status and respect in their community. They grow millet, indigo, and onions in fields below the escarpment. They tend small vegetable plots on any accessible ledge in the cliff, carrying water and soil to precarious heights. Crime is kept low; we leave our bags unattended during the day without a problem. Maybe the key to the Dogon's hard working reputations is their shortened workweek; the Dogon keep their own calendar, a five-day week. The day of the week is named after the village which hosts the market that day (Villages are grouped in clusters and a market day is held on a different day in each village of a cluster). 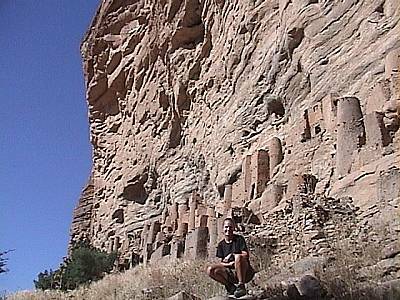 In previous times the Dogon built their houses high in the cliff. On the ground they assembled mud houses with wooden frames and granaries with conical roofs, then they hoisted these structures into teetering places. In recent times, with the advent of statehood and without the need for protection against warring tribes, the Dogon have moved their houses to the base of the escarpment. 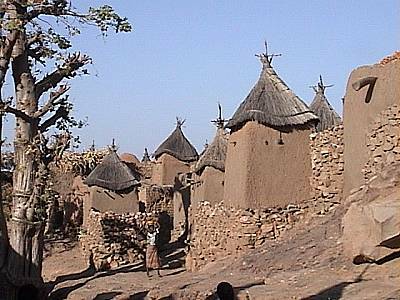 The Dogon are noted for their art forms, complex religious beliefs, and picturesque huts and granaries that seem to grow out of the escarpment. 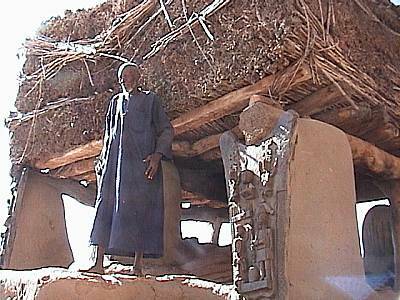 A striking feature of Dogon architecture: shutters and doorways, always carved with ancestral figures to protect people and things inside. Each house is unique and laid out in a religiously symbolic way, one-room mud huts inter-linked by stone walls and surrounding a tiny yard. Dogon men marry multiple wives but must maintain one hut and granary per wife. The granaries are identified by their conical roofs and stand on stone platforms for protection against vermin. Behind this man stands the togu-na, a special place where the village elders meet. The roof is kept low so the men inside must remain seated, thus preventing any physical fights during heated debates. Women are banned from entering. 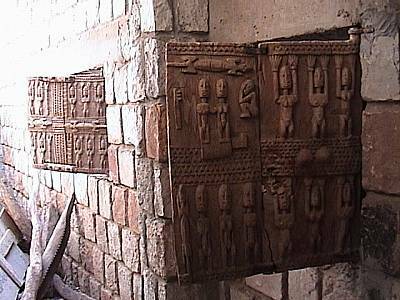 Bas-reliefs of the eight ancestors from Dogon mythology adorn the sides of the togu-na.